My name is Shannon and I'm a college student from Riverside, CA. For a little while now, I've been writing fanfiction to work on my writing technique and story-telling skills. My first foray into writing anything novel length. I got started writing it after being disappointed with reading stories from talented writers who keep writing the same plots over and over again. There are so many places left unexplored in fanfiction and I hope that if anything, my attempt here will spur people better than me into trying new and creative ideas. A horror/psychological thriller that remorselessly delves into the sinister natures of humans and demons and how they affect each other. I make no excuses for this story. It is dark. It is disturbing. Characters will do things that push the limits of not only their bodies, but what they believe in. True horror is a bit rare in this fandom with many considering anything from angst to vampires to be the embodiment of the genre. I wanted to write something that is not only horrifying and riveting, but deeply psychological as well. I don't expect this story to be very many readers' cup of tea, but if you enjoy suspense and gore, it may very well be worth your time. Summary: Lost and without direction, Sesshoumaru is the sole survivor of his kind in a time of glittering lights and monuments of steel and concrete, where he soon finds a purpose but from behind a mask. 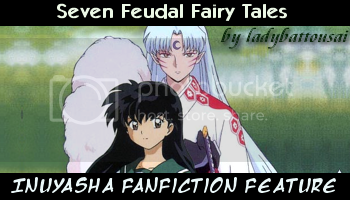 Summary: -Complete- Waking up from a nightmare late one autumn night, Kagome discovers Inuyasha is missing, leaving her to embark on a harrowing journey of death and consumption that will fade the line between human and youkai. Summary: Everyone has a bad day, even taciturn demon lords. Together with Rin and Jaken, Sesshoumaru discovers how bad a seemingly innocuous day can really get.